“During the Russian War (1854) a landing party from H.M.S. Hecla was attacked by a large body of Cossacks and many would have fallen had it not been for the courage of two sailors who taking cover behind this stone kept the enemy at bay until the safety of the whole party was assured. Captain Hall had the boulder carried to his ship and transported to Portsmouth“. Realising the defensive significance of this boulder, Ben took cover behind it to ensure nobody tried to steal his ice cream. It seems nobody knows much more about this boulder, nor indeed about the two sailors who saved the party. Even Portsmouth’s official Memorials and Monuments website states “We have no further information concerning this memorial”. Perhaps this is because HMS Hecla is far better known for another notable event during the same year. It was the Crimean War and HMS Hecla was off the coast of Finland, bombarding the coastal fort of Bomarsund, where the Russians were sheltering. The fort returned fire and during the height of the bombardment a live shell landed on the Hecla’s upper deck, its fuse still hissing. All hands were ordered throw themselves down flat on the deck but a Mate (the equivalent of a Midshipman today), Charles Davis Lucas, seized the shell and flung it overboard. It exploded before it hit the water. Some small damage to the ship was caused and two sailors suffered minor injuries, however, Lucas had undoubtedly saved many lives. The first list of recipients for the Victoria Cross was gazetted three years later, in February 1857. Lucas’s name appeared on that list; his act of bravery that day was the earliest act of bravery to win a Victoria Cross. Perhaps, therefore, the story of the stone has been overshadowed by other events and its details lost in time. The stone is remembered for one more thing, though. In 1965 a new ship was launched and named HMS Hecla. It’s captain was Captain Hall, the same name as the captain of the HMS Hecla in 1854. The Navy therefore suggested it would be fitting to move the stone to the quarterdeck of the new HMS Hecla for permanent display. Strangely, Portsmouth’s Council had no objection to this proposal. The Ministry of Defence, however, realised that the boulder was rather pointless and at the same time rather a heavy thing to carry around, so decided to proceed no further with the idea. 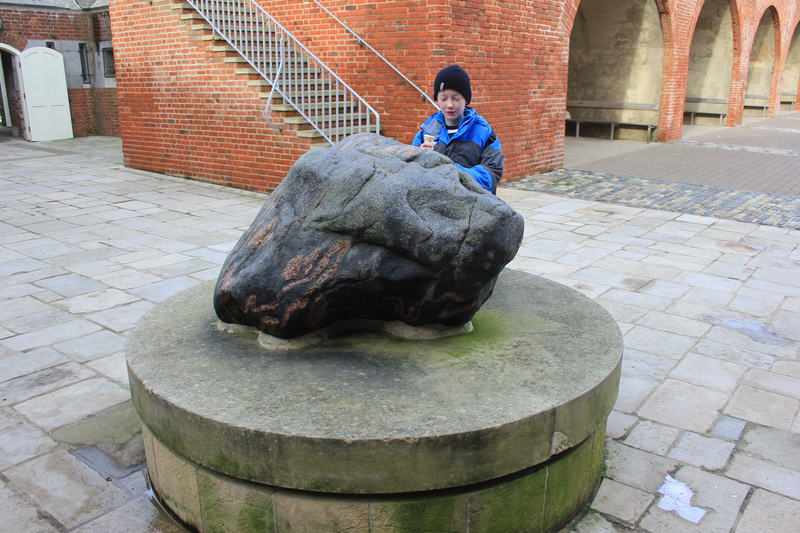 Thus it is that the boulder remains outside the Round Tower in Old Portsmouth, offering protection to boys with ice creams to this very day. This entry was posted in Hampshire, Islands and tagged boulder, coast, Hampshire, HMS Hecla, Portsmouth, stone, travel, Victoria Cross, walking. Bookmark the permalink. A very interesting story – and a very interesting rock. Being me, I can’t help wondering what it is made of and exactly where it came from. The veins of pink in the darker matrix make me think it is igneous or volcanic in origin. Interesting account on this page as Charles Lucas is buried in the churchyard of St Lawrence at Mereworth, near me and much acclaim is made of his claim to fame. If you would like I do have an image of his impressive celtic cross gravestone. Having promised an image of the headstone I’ll have to have a rummage for it. If not I’ll pop over there and get one. In the meantime here is one of his citation. Infact looking at this poor image I’ll get one of this too! Of course. I seem to have lost it in the depths of my harddrive. I may have to pop over there and get another one! Sorry for the delay but eventually got to Mereworth. Please find attached images of Lucas grave and the citation in the church.